Conventional gas and oil fired pool heaters consume large amounts of fuel. Solar pool heaters displace large amounts of fossil fuels and extend your comfortable season by about 6 weeks. Many pool owners don't heat their pool because of the cost of fuel. But who wants to swim in cold water ? A properly sized solar system can raise the temperature of a swimming pool between 2 to 4 degrees C in a day. 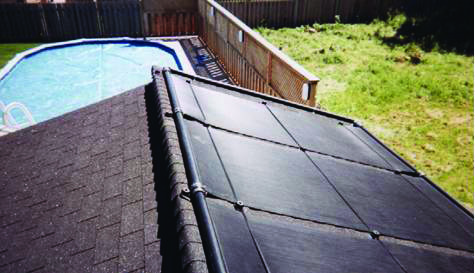 Installed on a south facing roof near the pool, these solar collectors extract heat radiated back from the attic as well as direct solar heating. Your existing pool pump pushes the water through the collectors. Auto controls and motorized valves allow you to set the pool temperature. Even large in ground pools can be solar heated for about the cost of the gas-fired heater and 1 or 2 years of fuel supply.